Sri Lanka has a rich cultural heritage, with monuments and temples build through a combination of Buddhist and royal history. The location of its historical structures has been hugely influenced by its fight throughout history to remain a separate country, retreating and then defending successfully invasions and intrusions from India in particular. Here is an Guide to some of the most important monuments and historic sites in Sri Lanka to help you choose where to travel. Aqua-Firma provides expert local guides and logistics for visiting all of these areas. For further information about each, please click on each image or where you read 'more'. You can also Contact Us with any questions and help in planning your perfect trip to this diverse island. Dambulla is most famous for its Cave Temple Complex, which is the largest and best preserved of its kind in Sri Lanka. There are more than 80 documented caves in the area, but there are five major caves which contains statues and paintings, primarily relating to Gautama the Buddha; but also 3 statues of Sri Lankan kings and 4 statues of gods & goddesses ... more. Jaya Sri Maha Bodhi is the oldest tree known to have a specific planting date (249 BC). Its religious importance is that it is believed to have derived from Sri Maha Bodhi at Buddha Gaya in India, which is the tree under which Gautama the Buddha is believed to have first attained enlightment. 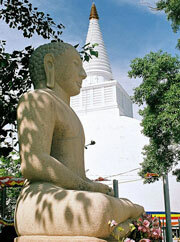 It is situated in the centre of the country close to Anuradhapura.